ROCKAWAY PARK, NEW YORK-NOVEMBER 10: Sofia Gallisa Muriente talks with other Occupy Sandy volunteers outside YANA (You Are Not Alone), a worker training community center, at B113 St. 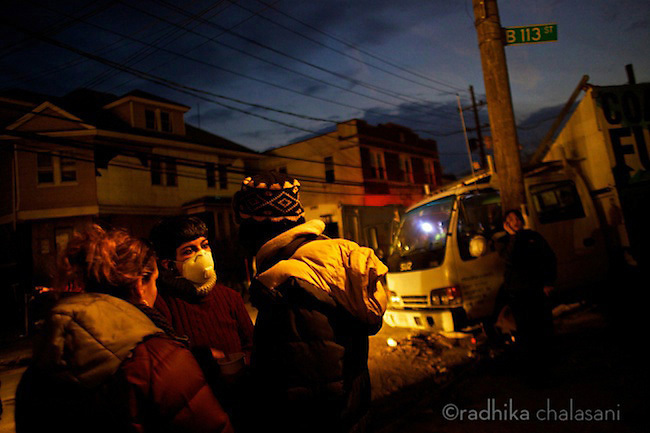 Occupy has been using as a hub for relief efforts in the Rockaways before their nightly meeting November 10, 2012. The Greenpeace truck has provided YANA and several small businesses solar power making it a small oasis of safety and activity in the still darkened streets of the Rockaways.